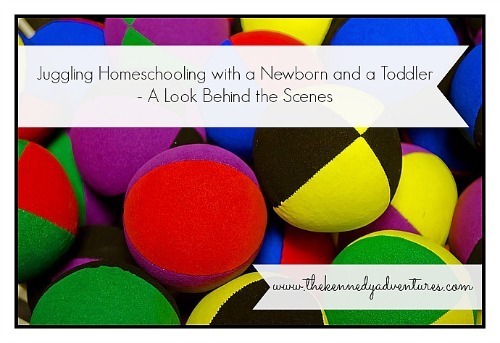 Juggling Homeschooling with a Newborn and a Crazy Toddler - the Behind the Scenes Look - The Kennedy Adventures! Homeschooling mothers have to field lots of questions – everything from choosing a curriculum to tips on homeschooling while pregnant. Even though I’ve navigated the waters of homeschooling with a baby before, I’m in uncharted territory now. I’m trying to manage homeschooling with a newborn, along with a crazy toddler. Today, I’ll give you a behind the scenes look and share my tips on how I’m handling the chaos here. 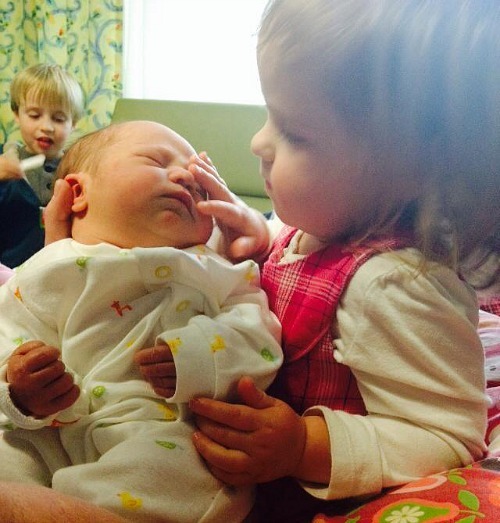 In my world, homeschooling with a newborn is doable. When Maeve was tiny, she was content to hang out with us while the big kids worked. As soon as she was mobile, things changed drastically. I’d set up my homeschool area, ready to go for the day, but Maeve would systematically dismantle my workboxes and carry them all over the house. Now, I feel like I’m herding kittens all day long. If I can get Rachel and the boys focused on work, chances are Maeve will be writing on the wall with crayons, or eating dog food. 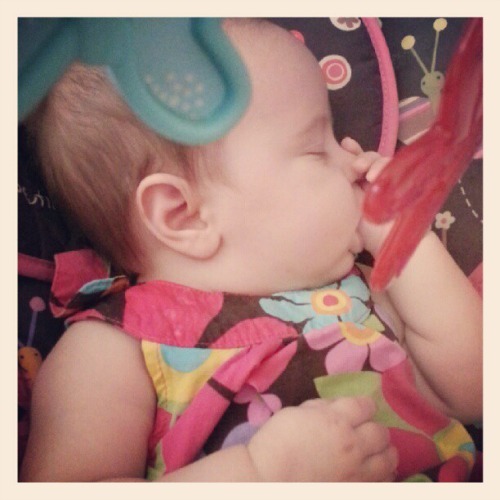 Here’s how we’re (sort of) handling juggling homeschooling with a newborn and a crazy toddler. This is a hard pill for me to swallow. I’m hard headed and want to do it all, right now. It’s hard for me to admit that I’m not superwoman. When I was pregnant with my twin boys, I stocked up on household necessities like toilet paper and toothpaste. I didn’t want to be left high and dry with four children at home. If I feel up to it, I start planning ahead while I’m pregnant by taking a look at things I can buy now and have on hand, saving myself a trip to the store. Amazon Mom delivers diapers, wipes, non perishable snacks and more right to my doorstep. Follow Dianna Kennedy – Kennedy Adventures’s board Simple Recipes for Dorks Like Me on Pinterest. I’m also trying to work on meal planning. Knowing what we’re having for dinner ahead of time decreases my stress level and saves us money. Over in the meals for new moms section, I’m sharing easy chicken dishes, easy beef dishes and easy breakfasts that are perfect for preparing now and freezing for later. I’m taking an honest look at my schedule and I’m working hard on easing up on myself. Seasons of life ebb and flow. 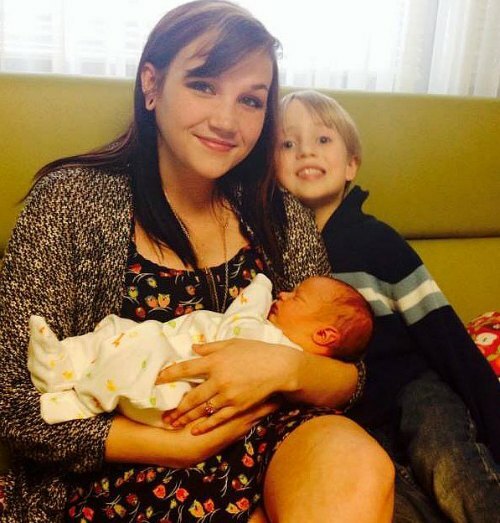 As trite as it sounds, my children are only small once. This is HARD WORK – and I’m trying to have realistic expectations. I’m closing my eyes to comparing my family to other homeschooling families. Brett and I are the best judges of what works for us. I’m thankful for homeschooling – we wouldn’t be able to take a break in a traditional school setting! Over the past few years, I’ve learned to ditch the traditional school mindset. Homeschooling doesn’t have to be Monday through Friday, 5 days per week. Currently, we’re homeschooling five to six days per week, but only a few hours per day. Sometimes it’s in the morning hours while other days we switch it up to enjoy the weather. 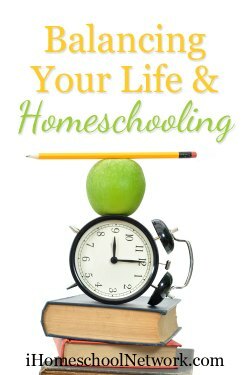 This year, we’re looking at a year round homeschooling schedule. I want to finish our curriculum, but on a slower pace. We’re relishing the flexibility that homeschooling offers while enjoying our family. During my pregnancy, my children were fascinated with the changes in my body and how the baby was growing and changing. Learning about fetal growth and development certainly wasn’t on any of our lesson plans, but we spent time exploring ultrasounds and discussing pregnancy symptoms. After Daniel arrived, and as Maeve is getting older, you’ll hear us discussing child safety and brainstorming activities to keep younger siblings engaged during the school day. During this busy season of our life, we’re focusing on the basics. As much as I’d love to be teaching Latin, working on art projects and exploring music, for now, I can’t get it all done. For now, we’re hitting reading, math, and Bible study. If things are running smoothly, you’ll find us squeezing in some nature studies to enjoy time outside together. We’re spending a lot of time on field trips, enjoying the theater and local attractions our area has to offer. In the past, I’ve tried to do it all – work, homeschool, juggle the household, and give the outward appearance that I’ve got it all under control. As I’m getting older and adding more children into the family, I’m much more honest with myself and with other people. I’m completely overwhelmed at this stage in the game, and that’s perfectly normal. I’ve finally learned to accept help from others. If my husband offers to pitch in and fix dinner every night, I don’t take it as an attack on my skills as a homemaker. I’m going to take this one day at a time, and know that I’ll get a handle on things, eventually. 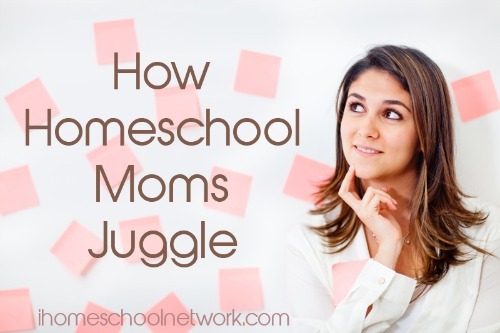 Want to see how other mothers juggle a variety of homeschooling challenges? Head over to iHomeschool Network to see how my friends juggle other homeschooling challenges, including homeschooling while working, going to college and more! Dangit!!! I have no babies or toddlers. Ahem… Why, no. I do not have dirty laundry and I’m not about to feed my daughter at 9:30pm. Nope. Great post! 🙂 You are pretty amazing! I agree that the newborn part is easier than the crawler/toddler stage! Hugs to you, Karyn! I know you’re in a very similar boat! Don’t you think that giving yourself grace is the #1 rule? This is a great and honest post. I can relate to the laundry piling up and the late dinners 🙂 But I only have 2 kids so I can’t even imagine how much more you have to juggle. You’re doing great though! 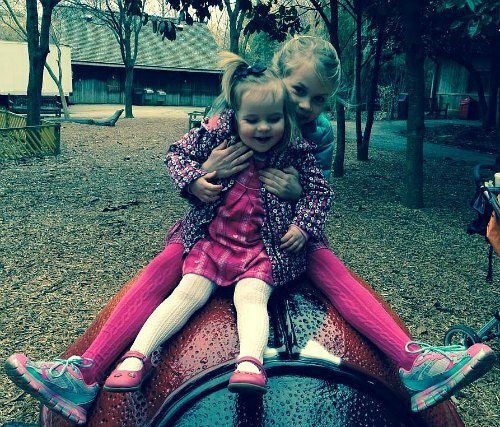 PS: That’s a very sweet picture of your daughter holding your newborn. Such words of wisdom. I struggled a lot with homeschooling my oldest son (7 years older than the next sibling down) while having the younger 4 who came along close together. I wish I had found a few older moms of many who could give me some tips for managing, and tips for understanding this is a season. I have a friend who has an 18 month old. Her other child, her daughter, is in my dd7’s class. I know Donna is frustrated with constantly chasing her young one at pickup while trying to have a conversation with the other moms. I support her as much as I can. We’ve talked a little about this being a season. 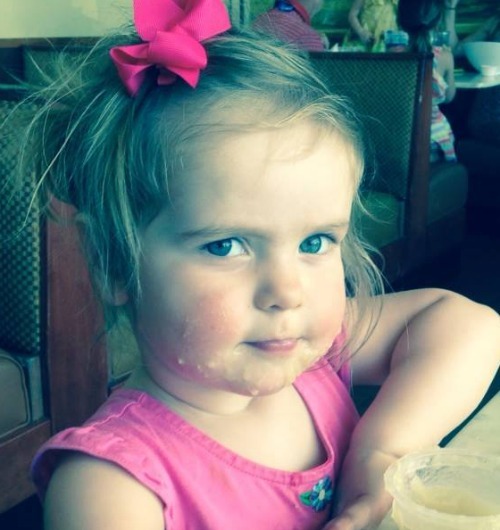 It’s not easy to see there is an end when you’re knee-deep in diapers and potty training. Both of the homeschooling posts that you linked up last week to Creative K Kid’s Thoughtful Thursdays are such great resources for those who homeschool. I pinned them to the Thoughtful Thursdays Pinterest board and featured them this week on Creative K Kid’s Thoughtful Thursdays.